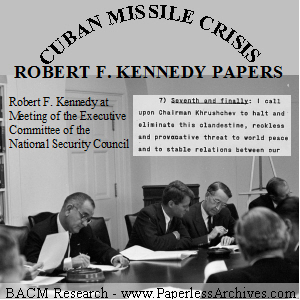 3,584 pages of documents produced or accumulated by United States Attorney General Robert F. Kennedy, while acting in his role as an advisor to President John F. Kennedy concerning the Cuban Missile Crisis. These documents were declassified through the National Archives and Records Administration's National Declassification Center and made available to the public on October 11, 2012. According to the head of the National Archives, David S. Ferriero, Archivist of the United States, "Attorney General Robert F. Kennedy played a crucial role in the peaceful resolution of the crisis, and researchers and the public are keenly interested in the information and insights contained in these documents." These files were transferred from the Department of Justice to the National Archives after Robert Kennedy resigned his post as Attorney General soon after the assassination of John Kennedy. The coverage contained in these files are of events, deliberations, and actions, usually outside of the scope of the jurisdiction and responsibilities of the Attorney General. However Robert Kennedy's special relationship as both the brother of and special advisor to President Kennedy made him the closest man to JFK during the Cuban Missile Crisis. The materials include papers, memorandums, correspondence, reports, notes, doodles, hand written material, accounts of Executive Committee meetings, and notes on private meetings with President Kennedy. This collection also includes telegrams, cables, and reports sent by the CIA, State Department, and FBI related to the Cuban Missile Crisis and its aftermath. One folder of material maintained by Attorney General Kennedy included copies he kept of memos written to the President about meetings RFK had with Russian ambassador Anatoly Dobrynin, copies of correspondences to and from President Kennedy and Soviet Premier Nikita Khrushchev, and draft copies of speeches made by President Kennedy concerning Cuba. 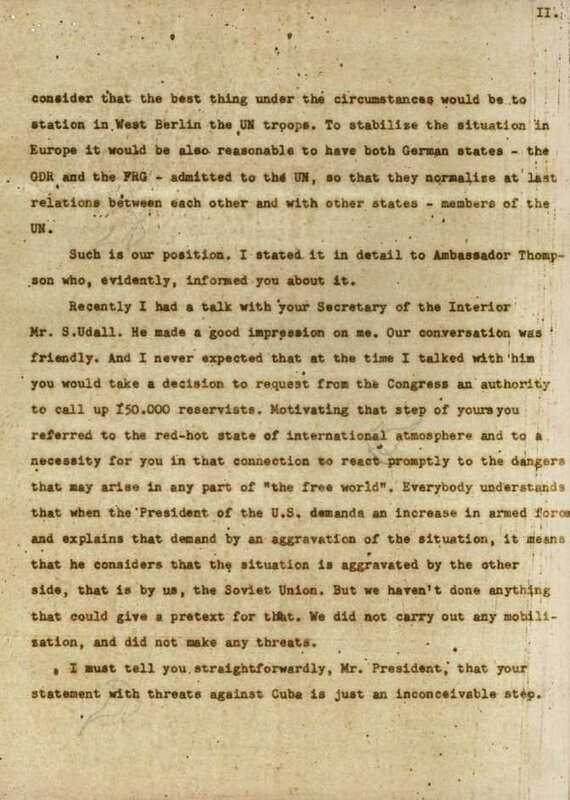 One page from a 17 page September 1962 correspondence sent by Premier Khrushchev to President Kennedy, which was passed from Ambassador Dobrynin to Attorney General Kennedy, who gave it to the President. 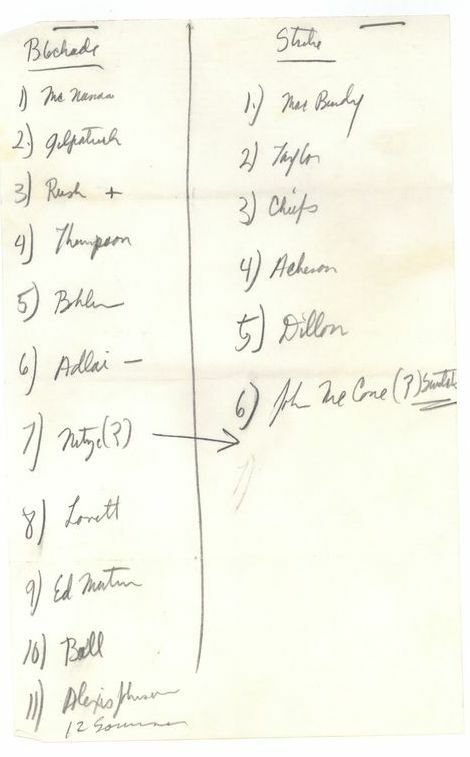 This note handwritten by Robert Kennedy on October 16, 1962 lists the initial split between the ExComm advisors to President Kennedy on the action that should be taken against the Soviet Union and Cuba. Names are written under two columns, "Blockade" and "Strike." The first use of the collective term "hawks and doves" was applied to those making the choice between to the two basic paths to take during the missile crisis. "Hawks" wanted an instantaneous military action taken against Cuba, airstrikes to destroy the missile capability deployed in Cuba. Doves believed that negotiations held during a blockade could lead to the removal of the nuclear threat in Cuba. Assistant Secretary of Defense Paul Nitze, who the note shows was moved from the Blockade to the Strike column. Letter to Fidel Castro from the Department of State drafted at the beginning of the Cuban Missile Crisis. A draft of a State Department letter written to Fidel Castro on October 17, 1962. It represents the first efforts to establish diplomatic communications between the Unites States and Cuba during the missile crisis. Historians at the State Department have previously said that they could not find any of the drafts of the early communications with Castro made during the crisis. Caribbean area are being installed at three sites. They obviously have no use except with nuclear heads. by Soviet Military, not Cubans. Cuban Missile Crisis State Department Document listing options to take during the crisis. This October 25, 1962 State Department memo titled "Political Path," outlines several options. 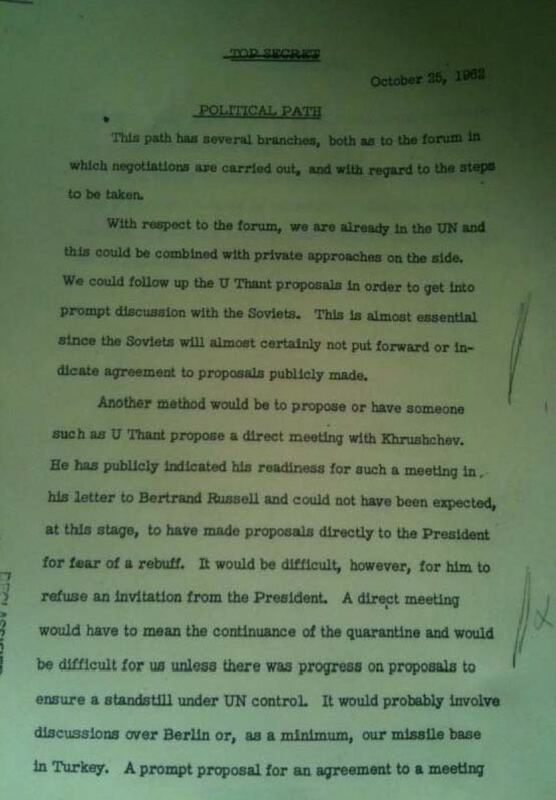 One option is for a direct meeting between Khrushchev and President Kennedy. Another option listed was to put under United Nations control both the Soviet missiles in Cuba and the American missiles based in Turkey. 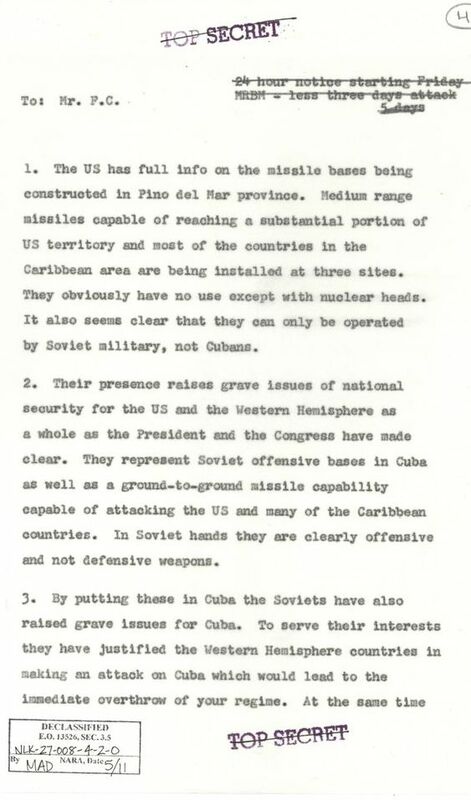 Cuban Missile Crisis Department of State cable concerning establishing secret negotiations with Cuba. 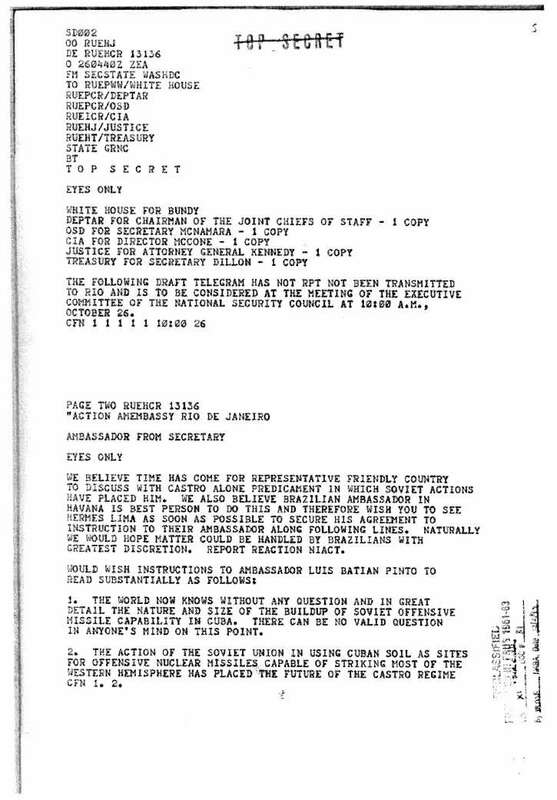 This formerly classified cable documents the work to establish back-channel negotiations with Cuba. It proposes to use Brazil as a go-between to establish secret communication with Cuba. greatest discretion. Report reaction NIACT. in anyone's mind on this point. and the well-being of the Cuban people in great jeopardy. 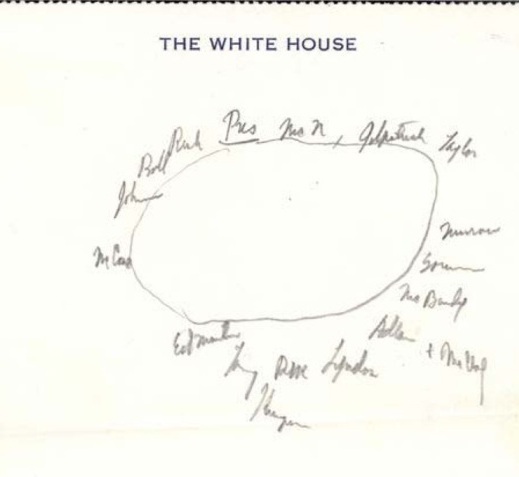 Doodle drawn by Robert Kennedy, a diagram of the seating arrangements of senior officials at an ExComm meeting.